The ARUA Water CoE aims to be a centre for innovative and progressive research, which focuses on the African response to the Sustainable Development Goals (SDGs). Water plays a vital role in ensuring equitable, stable and productive societies and functional ecosystems. Hence, the United Nations recognised ensuring sustainable management of water and sanitation as one of the seventeen sustainable development goals (SDGs) (i.e. Goal 6) (https://sustainabledevelopment.un.org/). Consequently, SDG 6 expands the millennium development goal (MDG) focus on drinking water and sanitation to now cover the entire water cycle, including the management of water, wastewater and ecosystem resources. The CoE recognises that water is the key thread and catalyst to also realising the remaining sixteen SDGs in Africa. Africa has a growing population that requires ever-increasing food and energy to grow production bases. Meeting these needs is placing a considerable strain on the continent’s water resources and this problem is compounded by variable climate conditions, poor water infrastructure and pollution. In addition, being the fastest urbanising continent, the demand for water and sanitation in cities is fast outstripping supply. The rapidly growing populations in Africa have also resulted in increased agricultural and industrial activities, which pose a threat to availability, accessibility and quality of freshwater resources. Within this context, water is a limiting factor for food security in the water-food-energy nexus, and these connections will also form a central theme of the Water CoE focus. The Water CoE aims to facilitate nodes of excellence into conceptual focus areas, within which other research institutions can work, thereby developing vision and integrative capacity focused on working towards the realisation of the SDGs in Africa. From a water perspective, one of the major challenges faced by the water sector in Africa is a lack of capacity in terms of determining the volumes of the available water resources, determining and managing anthropogenic impacts from activities in the catchment as well as determining their sustainable and efficient use. There is increasing recognition of governance failure at multiple scales, further exacerbating the challenge of sustainable water resources and supply management on the African continent. The shortage of trained personnel in the water sector frequently results in this gap being filled by experts from outside the continent who may contribute to the solution of specific problems, but do little to contribute longer-term development of capacity within the continent. The ARUA has as its primary aim bringing together a number of peer African institutions to pool their limited resources and use them to generate a critical mass that could more effectively support each other and the growing numbers of researchers. Therefore, the ARUA Water CoE seeks to contribute to the development of capacity by training high level academic and professional expertise in both the science and management of water resources using existing networks of university academics and researchers within Africa as well as working collaboratively with water resource professionals, researchers and academics outside the continent. SDG 6 – Clean Water and Sanitation is at the centre. We recognise water as intrinsically being 1) water in the landscape – the catchment/watershed) and 2) the delivery of water services (water supply and sanitation. These two are encircled in blue. On the left is a blue circle focused on water resources in the landscape. Water resources involve three key SDGs: i) SDG 6 – Clean Water and Sanitation, ii) SDG 15 – Life on Land and iii) SDG 13 – Climate Action. The water resource (SDGs 6 and 15) is linked to Climate Action – SDG 13 through Adaptation. These three are supported by SDG 16 – Peace, Justice and Strong Institutions through policy and good governance, including participatory governance. 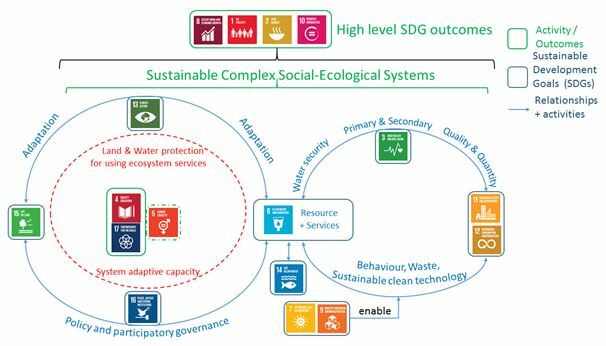 Together this suite of SDGs (6, 13, 15, 16) provide a research focus on the protection of land and water (catchment) ecosystem services, leading to an understanding of system adaptive capacity. Intrinsically this means we see people in the landscape as a social-ecological system. At the centre of this water resource view research, three SDGs are supported: i) SGD 4 – Quality Education through the development of ARUA researchers and their post-graduate students AND the communities with whom they will engage; ii) SDG 5 – Gender Equality through mainstreaming gender into all ARUA Water CoE activities and outcomes; and iii) SDG 17 – Partnerships for the Goals though a recognition that engaged action research always brings patterns, and therefore the co-creation of knowledge into the process. The blue circle on the right focuses on water services and their delivery. Here, water service delivery is fundamentally essential to SDG 3 – Good Health and Well-being which requires research attention on primary and secondary water scarcity in terms of both the quantity and quality of water. Water security is necessary for i) SDG 11 – Sustainable Cities and Communities and ii) SDG 12 – Sustainable Consumption and Production. Research into human behavior, waste management and sustainable clean technologies related to water are also drivers of SDGs 11 and 12. Linked to, but not the focus of, research within the ARUA Water CoE are: i) SDG 7 – Affordable Clean Energy, and ii) SDG 9 – Industry Innovation and Infrastructure as critical enablers of water service delivery; and iii) SDG 14 – Life below Water links to SDG 6 mainly through multiple aspects of estuaries. We use the concept of complex, adaptive social-ecological systems as the integrating framework to channel water-related research into resolving and addressing the challenges associated with SGS 1, 2, 8 and 10: SDG 1 – No Poverty, SDG 2 – Zero Hunger, SDG 8 – Decent Work and Economic Growth, and SDG 10 – Reduced Inequalities. 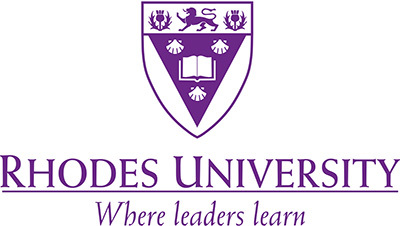 The current ARUA Water CoE partner institutions include the universities of Rhodes, Addis Ababa, Dar es Salaam, Lagos and Cape Town. To conserve and use water wisely, integrated catchment-level approaches to water resources management are essential. Thus, all the core partners envisage the Water theme as encompassing the scholarship and practice of integrated water resource management (IWRM). Each of the partners will offer a specific area of excellence, with supporting expertise from other nodes to strengthen our collective capacity to secure research funding, successfully supervise highly-capable post-graduate students, and produce excellent research outputs that contribute significantly to engaging the acute and chronic freshwater challenges facing the continent. The hub will apply effective engagement mechanisms that support the partnership and its projects. An overview of the partners and their expertise is provided below.